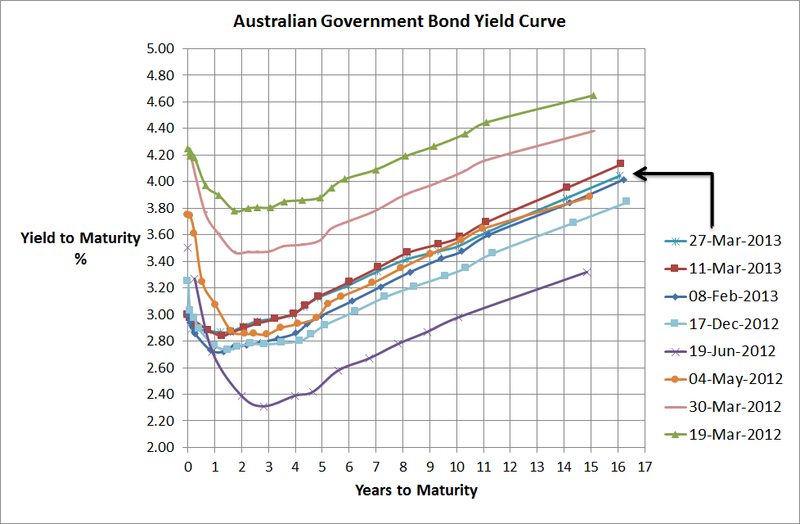 The above chart shows that the Australian Government Bond Yield Curve really hasn’t moved that much in the last 3 months…around an increase of 20bps which is not much at all when you consider all the talk about switching from equities to bonds. The reality is that there has not been any switch from equities to bonds, just that all of the money printing from central banks around the world need to find a home and that home is the risky assets; equities, credit, commodities; and currencies such as the Australian dollar. The bond yield curve above shows that yields stay between 2.8% and 3% out to a term of 4 years, so the market is essentially saying the Reserve Bank will keep rates on hold on Tuesday and it should stay that way for a few years yet. At most, there may only be one more decrease by the RBA and that may occur later in the year if at all. Moving forward whilst the US, Japanese, European, UK, and Swiss central banks continue to print money the above-mentioned risky assets will probably be well supported (Europe’s problems will add to volatility) but as we’ve seen over the last 3 months or even 12 months, I don’t expect yields to move significantly unless there is a serious upward surprise in inflation…and that appears quite unlikely at the moment so no bursting of the bond bubble yet….just continued low returns.